“Grilled vegetables don’t have to be uninspired,” said Brooke Lewy in Vegetables on Fire (Chronicle Books). When you want them to be the stars of a summer meal, round out their sweetness with salt, something that contains a bit of fat—like the feta cheese in the dish below—and perhaps something crunchy, like croutons or nuts. A ratatouille prepared on a grill makes a great entrée. “Summery, light, and just a little bit fancy,” it’s a dish that can showcase great veggies from the local farm stand. Season it generously, and serve it with orzo on the side or piled atop grilled crusty bread. Heat grill to medium (you should be able to hold your hand 6 inches above heat source for 6 to 7 seconds). Place first four vegetables in an 8-by-8-inch baking dish or 10-inch cast-iron skillet. Add 3 tbsp of oil, toss to coat, and season liberally with salt and pepper. Brush onion slices with 1 tbsp oil; season with salt. Transfer all vegetables to grill. Cook until they take on grill marks and start to soften, 3 to 4 minutes, flip, and cook another 2 minutes. Transfer to a plate. 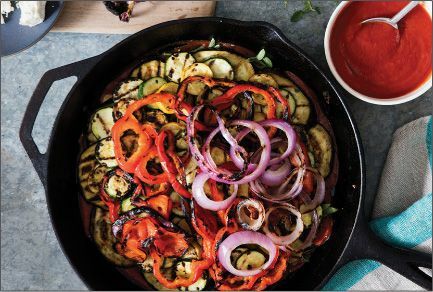 While vegetables grill, pour tomato puree into the baking dish or skillet, which should have a bit of oil and salt left behind. Season with additional salt and pepper. Add garlic and leaves from 2 oregano sprigs; stir to incorporate. Set aside. Assemble the ratatouille: In the baking dish or skillet, arrange a layer of eggplant on top of tomato puree, overlapping slices slightly. Follow with a layer of zucchini, then one of onions, then peppers, then squash. Repeat until all vegetables are used. Press down lightly to compress layers, drizzle with remaining 2 tbsp olive oil, and add leaves from remaining oregano sprigs plus another sprinkling of salt and pepper. Crumble feta over top. Place dish back on grill and cover. Cook ratatouille, undisturbed, for 10 to 15 minutes, until sauce is bubbling and starting to caramelize at edges, vegetables are soft, and feta is melted. Remove from grill and sprinkle with parsley. Cut ratatouille into squares, so different layers are visible from side. Serves 4.